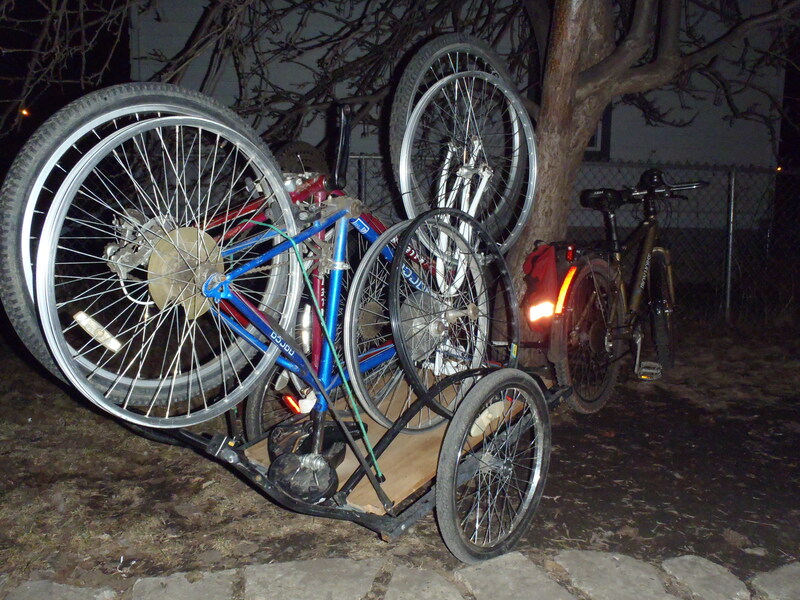 It’s Spring in Edmonton and the bikes are multiplying in the Tuckamoredew household. This latest arrival was the result of an uncharacteristically instant decision on my part. Normally, I delay and loudly agonize over any bike related purchase until my wife tells me to buy it or be quiet. While most of my purchases come via Kijiji classified ads, this time it was from Pinkbike. I usually only check Pinkbike for parts and not complete bikes, particularly not road bikes. Any road bikes listed are usually quite new and are typically at least $1000. This is well outside (think astronomical distances) my budget for casual bike purchases. 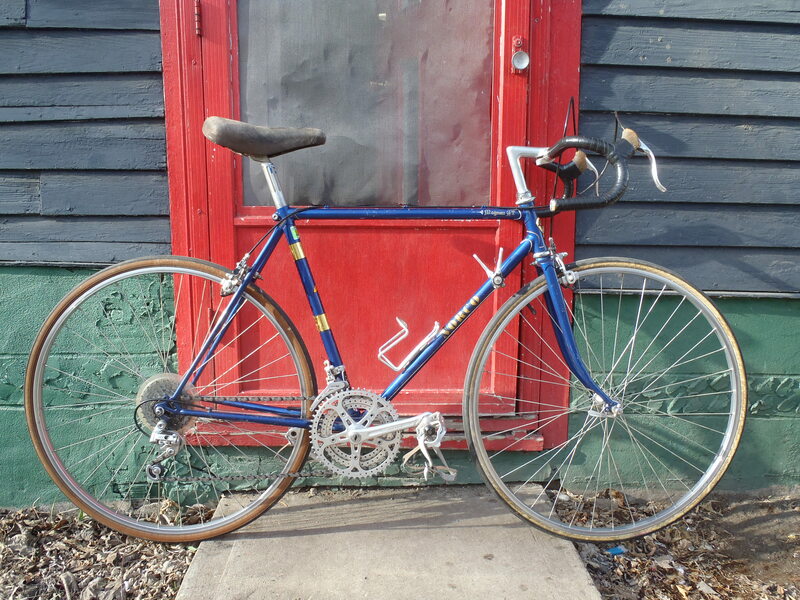 However, on impulse I checked and spotted this nice vintage road bike listed for $75.00. After a quick flurry of electronic communication with the seller I had agreed to buy the bike and pick it up early the following morning. 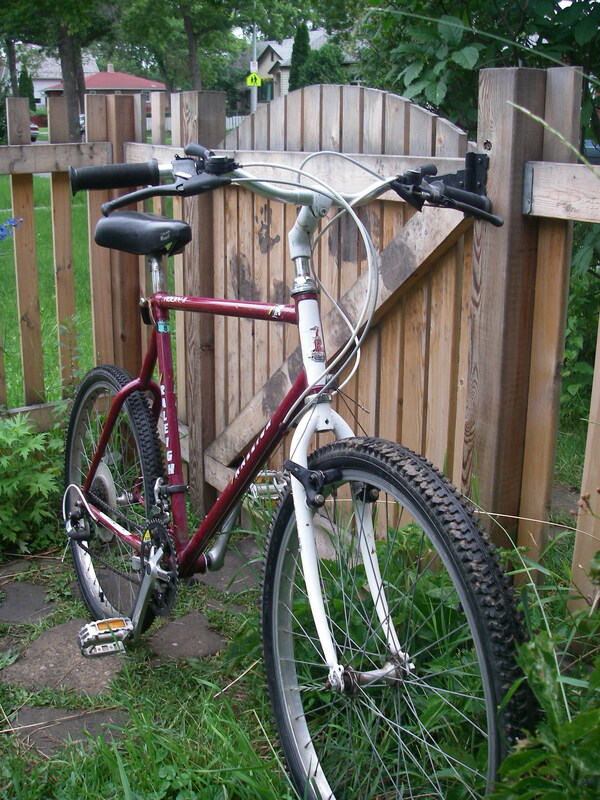 The seller was a second year university student who had bought the bike to covert to fixed gear but decided instead to stick with his trials mountain bike. This was fine with me as this bike is in such good and original condition that it would be a shame to fixify it. 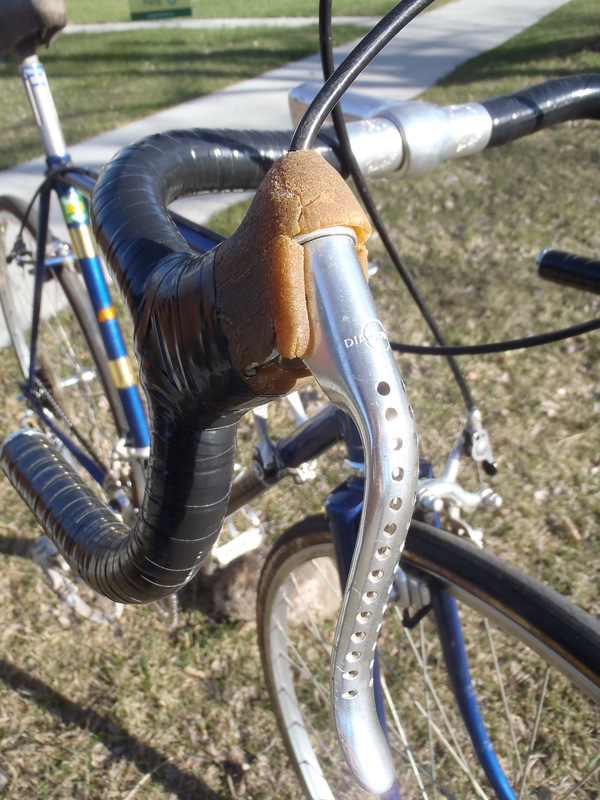 Dia-Compe side-pull brakes with drilled levers. 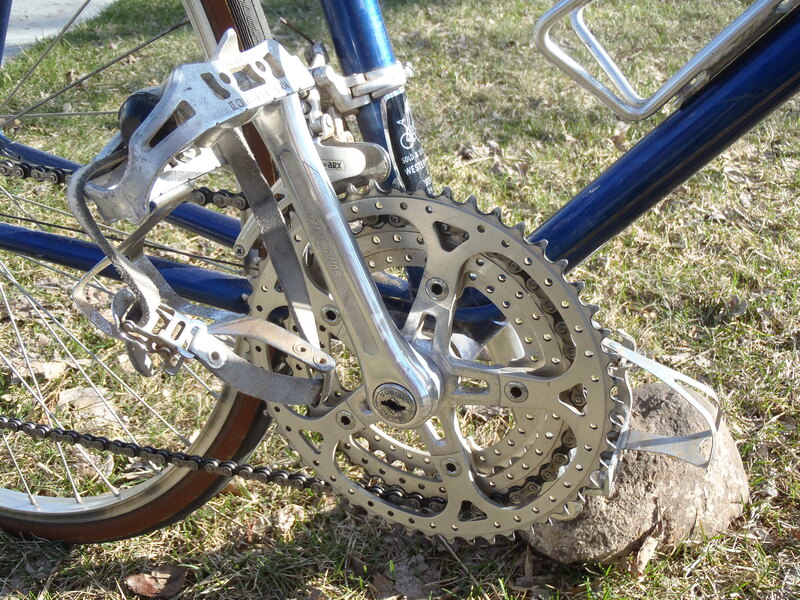 It was the drilled chainrings and cartridge bearing hubs that caught my attention in the sellers ad. They are pretty much identical to the components on my much loved ’83 Nishiki Continental. At the very least, I thought, I would be able to use this bike for spare parts for Nishiki-san. 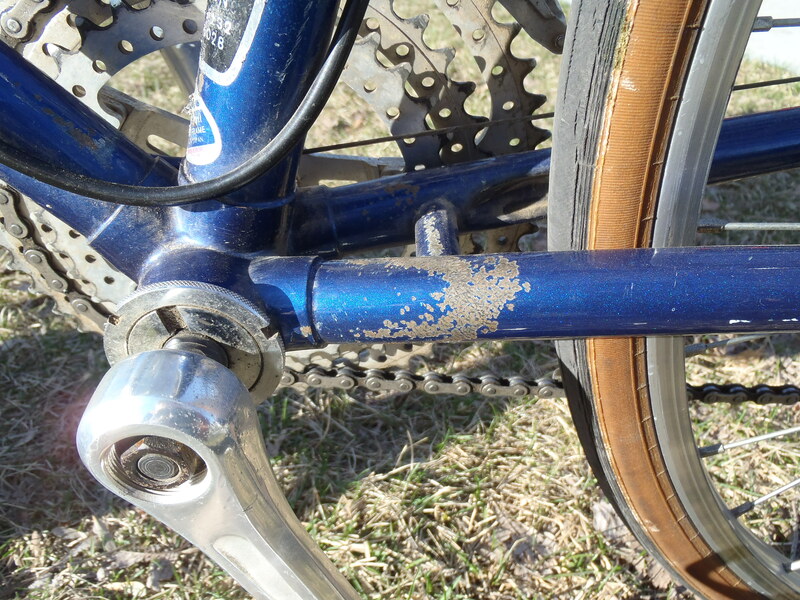 As it turns out, the bike is in excellent shape and except for the decrepit tires it’s in good riding condition. 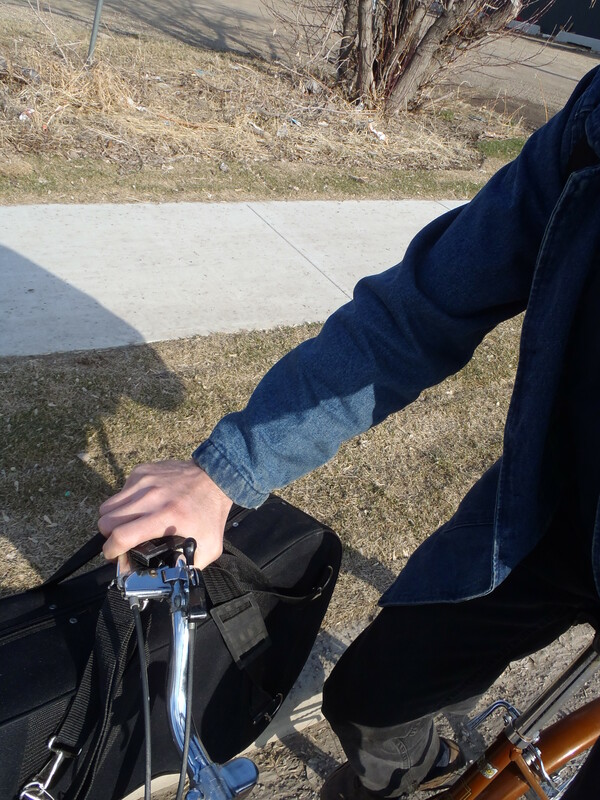 I haven’t taken it for a long ride yet because of the shabby tires but the short neighbourhood jaunts I have taken have shown it to ride light, very smooth and fast. It handles nimbly and stops quickly. It is, unfortunately, perhaps a tad small for me. Not so small that I won’t ride for a while before making up my mind if I’m keeping it. 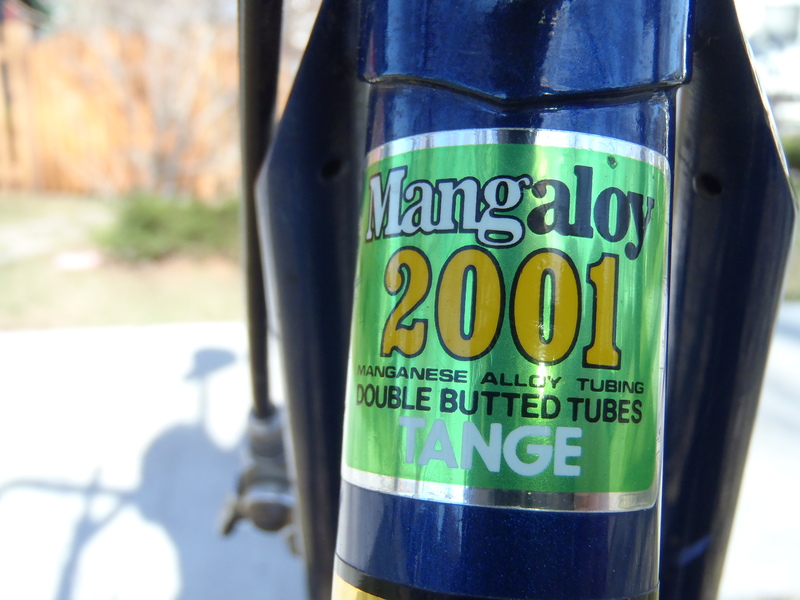 Mangaloy was Tange's brand name for a manganese-molybdenum steel. Quality wise it lies between Hi-Ten and Chromoly. Its chief virtue compared to chromoly was that brazing temperature wasn't as critical and was therefore better suited to automated manufacturing. 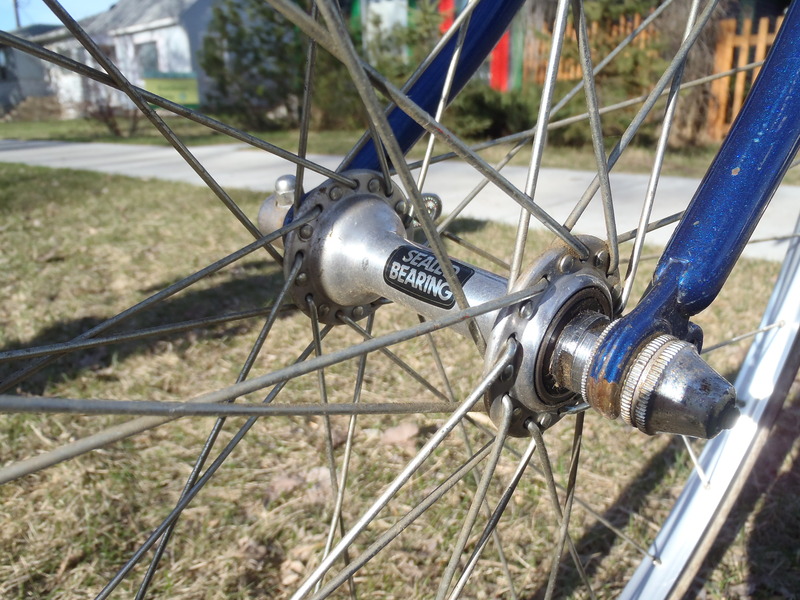 I'm always unreasonably impressed by cartridge bearing hubs in older bikes. I like these factory drilled chainrings, though they aren't quite as fantastically improbable as the real serious cases of drillium. Doubtless, they are sturdier. 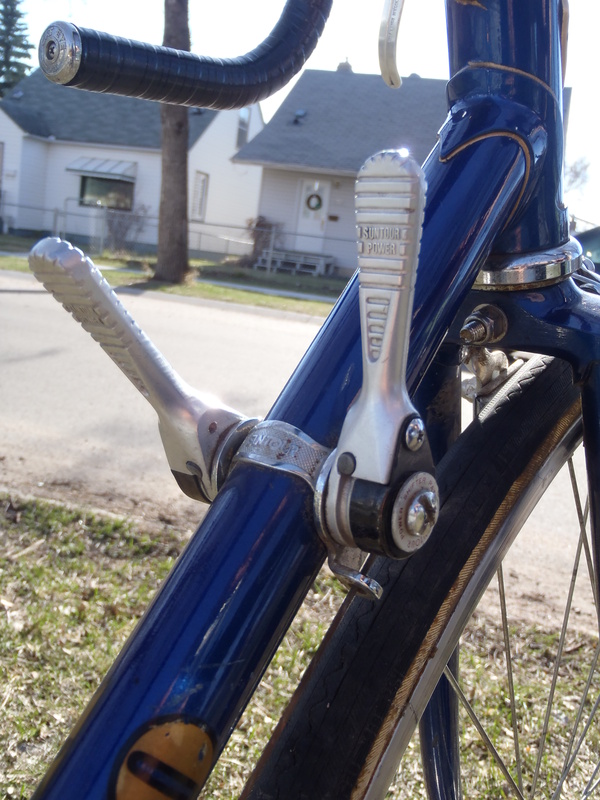 I have Suntour ratcheting thumb shifters on my winter bike and they are as nice as friction shifters get. I have a couple of sets of these ratcheting downtube shifters in my parts box but I'd never got around to installing them on a bike. The small amount of riding I've done on this bike indicates that they are also very nice, as expected. I'll be replacing the hoods and electrical tape bar wrap. This is the worst bit of paint damage. Otherwise, there are only minor scuffs and scratches. Norco, based in British Columbia, is currently the ubiquitous Canadian brand with bikes for all ages, of many types, at a range of prices. Although they’ve been around since 1964 there’s not a lot of information online about their early days. They seem to have been involved with a number of Japanese manufacturers before they ever marketed bikes under their own brand: my ’83 Nishiki Continental has a decal that reads “Designed by Norco”. This Magnum GT is likely from only a year or two later and definitely has similarities to the Continental. Norco acquired the Japanese bike company Sekai in 1983 and later phased out the brand in favour of their own. 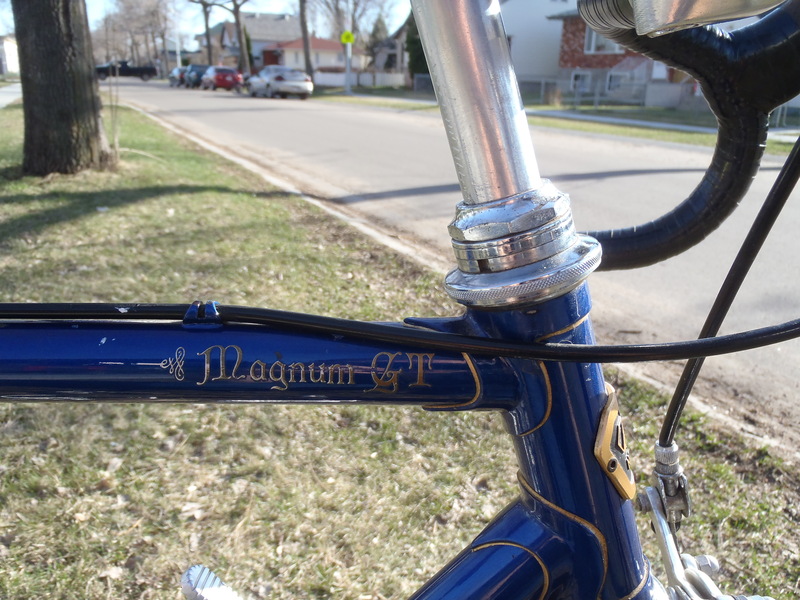 I have found pictures online of several Sekai Magnum GT bikes and they are unsurprisingly nearly identical to this Norco bike. The GT apparently stands for Grand Touring and some of the bikes seem to support this. 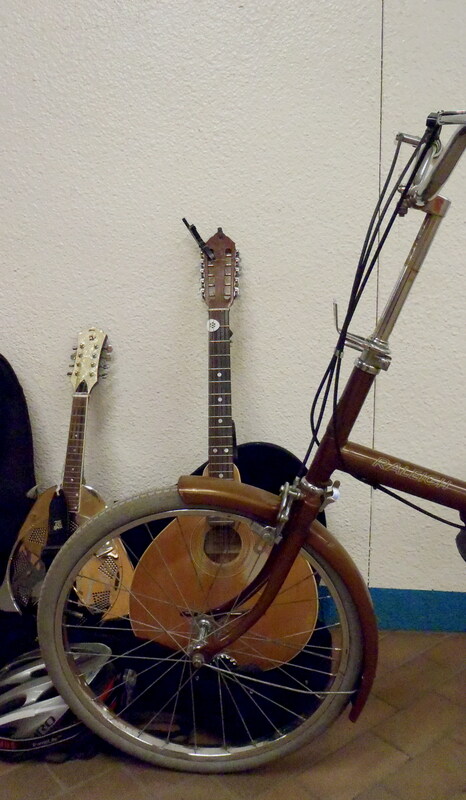 This one however isn’t a convincing touring bike except for the triple crankset. Whatever it is, I’m enjoying it so far and I’m looking forward to getting some new tires on it so I can rack up a few kilometers. This may be my best bike score to date. I do wish it was a little bigger, though. 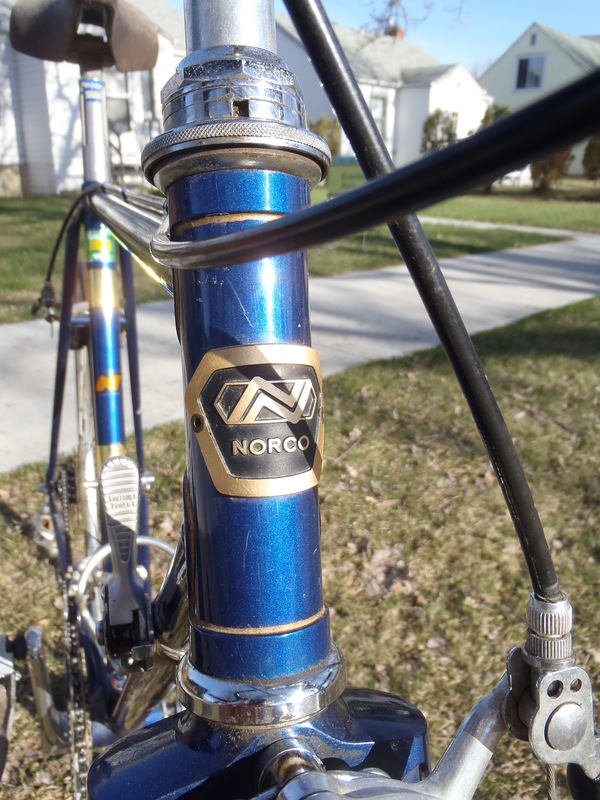 I like the old Norco head badge. Somebody was a little extravagant with the cable housing. Rocky, I barely knew you. In an effort to reduce the bike fleet I’ve recently given the Rocky to someone else, a friend of a friend who needed a bike for transportation and couldn’t afford one. 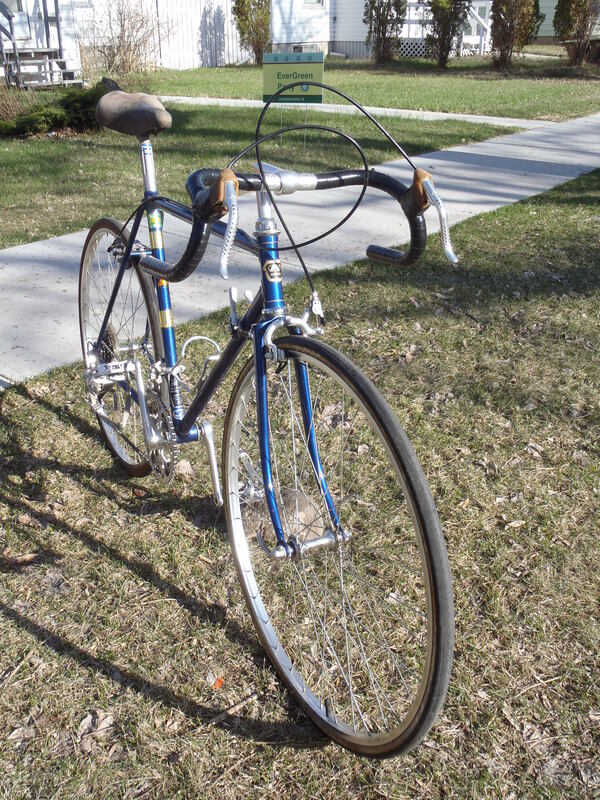 I bought the bike last year at a police auction for the princely sum of $40.00 but never really rode it a lot. Although I did like the way it handled it never did quite find its way into regular rotation (no pun intended). 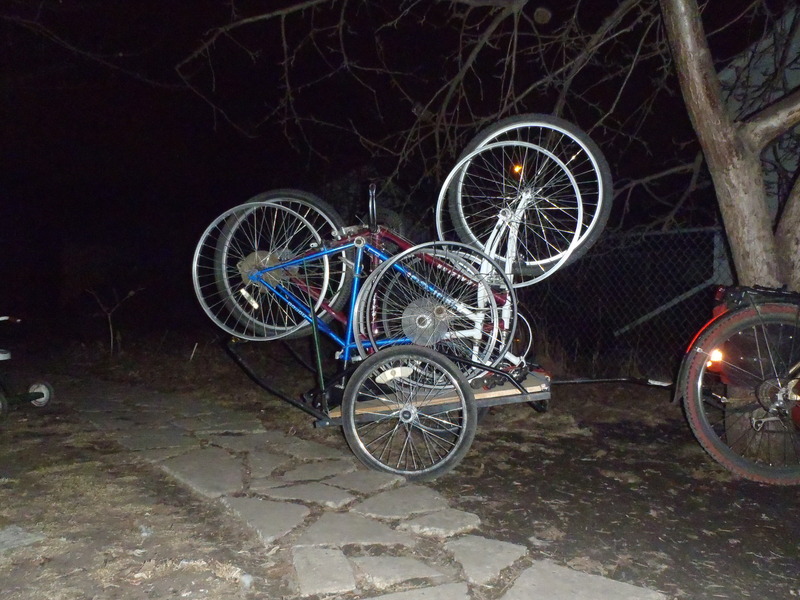 I had plans of converting it into a DIY longtail bike, but in all honesty I knew it would be a long time before I would get around to that project. Fixing this bike up to pass on was a learning experience in generosity. 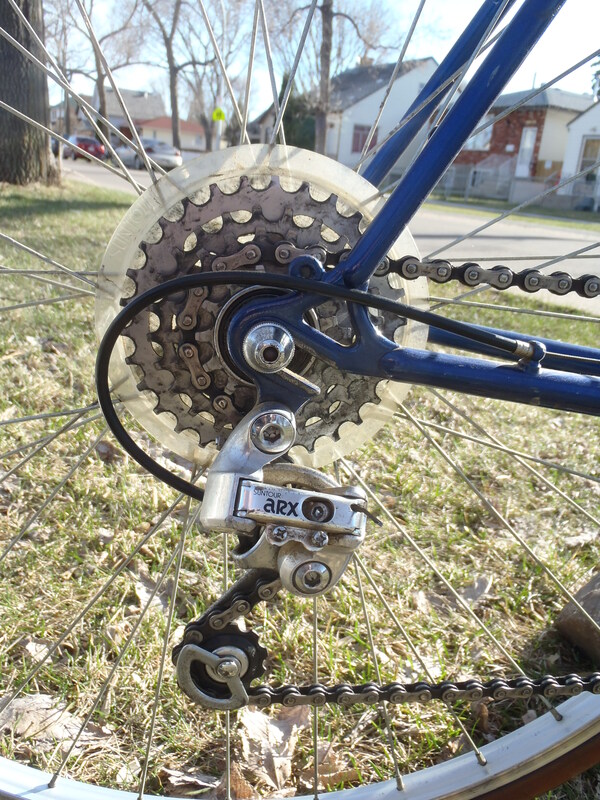 I initially thought that I would salvage several of the components from the bike to recoup my costs and replace them with cheaper parts from my small stockpile. This did not work so well. There were compatibility problems and I spend a lot of time trying to make the replacement parts work. In the end, I had to put most of the original parts back on the bike. This represented a lot of wasted time. 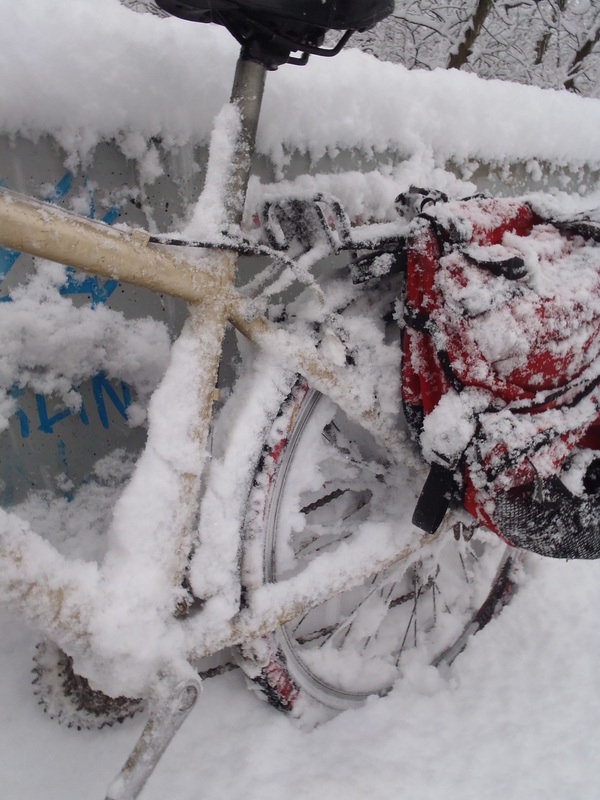 If I had just tuned up the bike it likely would have taken me less than an hour to have the bike ready. Instead, it took more than 4 hours. In the future I will not let my cheapness overwhelm me. This turned out not to reduce the bike fleet as I had planned. On Saturday, I scored a fantastic deal on an excellent vintage road bike that I simply could not pass up (more on this soon). Furthermore, on the same day, while volunteering at a ravine cleanup I found a partially dismantled mountain bike of decent quality. I’ll be reporting that one to the police to see if I can find its owner. Nonetheless, there seems to be some sort of Law of Conservation of Bikes at work. 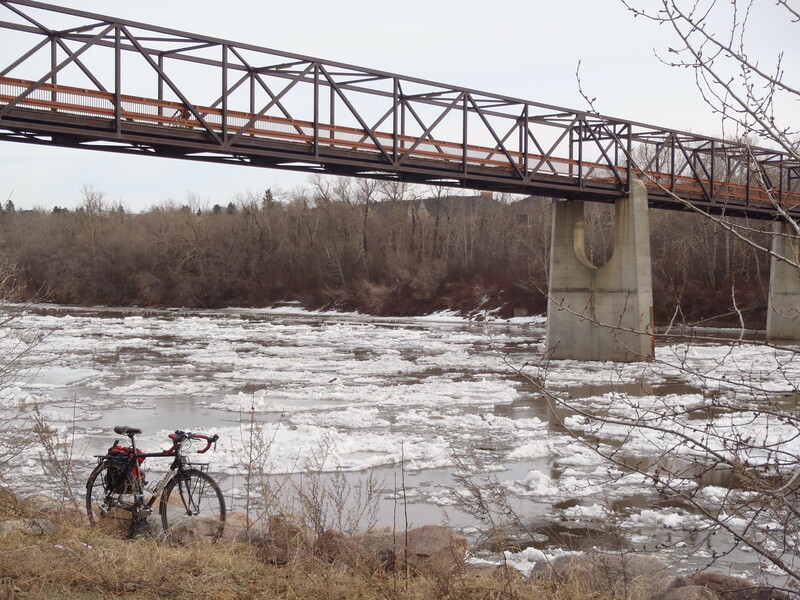 The short stretch of the North Saskatchewan River that I see each day has been ice free for a little while now. 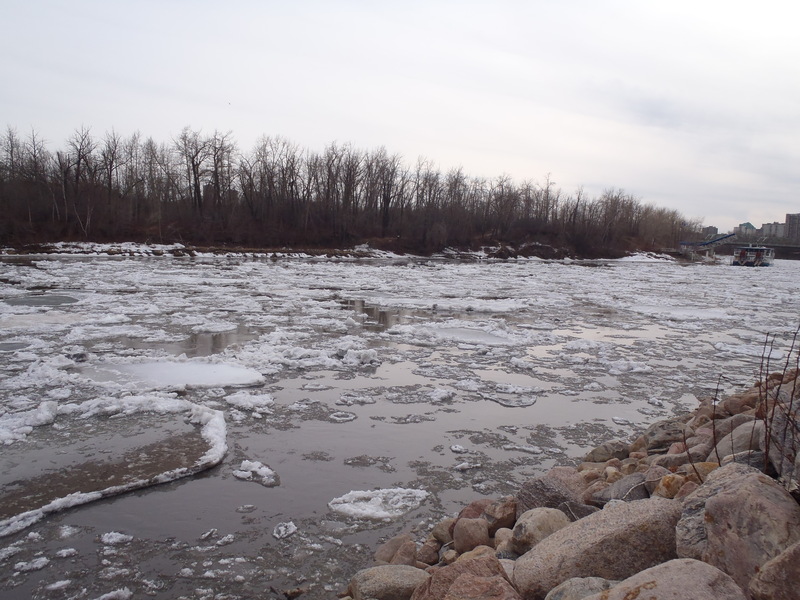 However, a few days ago there was a lot of ice moving through from further upstream. This is a spectacle that only lasts for a little while an I’m always glad when I don’t miss it. The implacable force of the river suddenly becomes obvious as it pushes the pans of ice downstream regardless of obstacles. There is constant low rumbling noise accompanied by a crystalline tinkling. When I was standing on the pedestrian bridge watching the large sheets of ice split against the piers it was reminiscent of the ice-breaking ocean ferries that I traveled by back on the East coast. Powerful. I took a short video clip of the river break-up but it doesn’t really capture the experience. In bike related news, I have been riding the Kona Jake cross bike again for the last couple of weeks. This was my first real bike and I still love it. It’s fast, nimble and rugged: a good compromise between a road bike and a mountain bike. The Jake is Kona’s entry level cross bike and I really think it’s aimed at people like me rather than anyone who might actually race it. 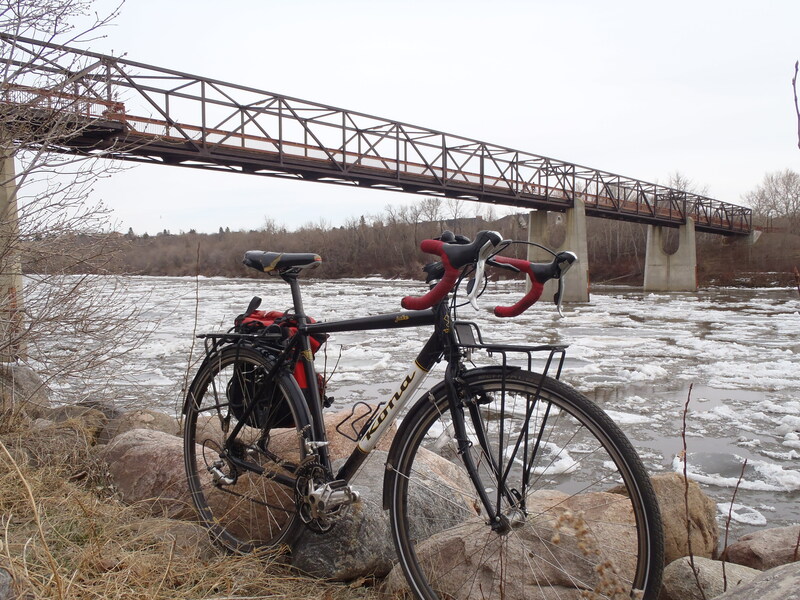 This is my favourite bike to ride once the snow is mostly gone. And someday soon it will really be gone. I hope. In light of yesterday’s snowstorm it may seem that my early declaration of Spring was hasty. Not at all. These have merely been the inevitable Spring snowfalls. Furthermore, I assure my fellow Edmonton residents that this was the last major snowfall of the season. You have my money back guarantee. I was disappointed when the storm warning was issued. I’d had great hopes of taking my first real road ride of the season over the long weekend. Work, weather and other responsibilities have been foiling me for weeks now. However, on the morning of the storm it was hard to maintain a gloomy frame of mind. When I stepped out the door I was gobsmacked by the quantity and quality of the snow that had had fallen while I snoozed. It wasn’t the light powder that we typically get here in Edmonton. 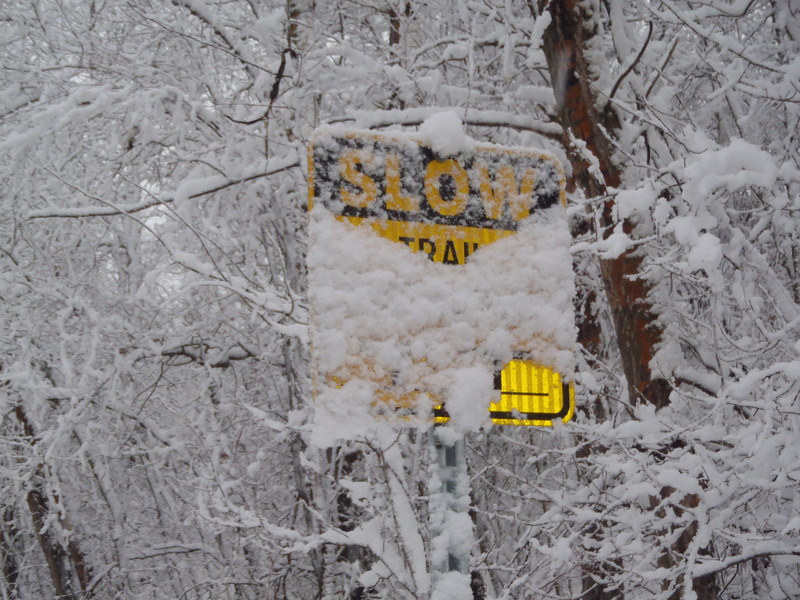 Heavy, wet snow was falling in giant clumping flakes encrusting everything in sight, an authentic winter wonderland (excuse me, a Spring wonderland). It was reminiscent of a good storm back on the East coast. I may have giggled a little bit as I headed to the garage to get my bike. 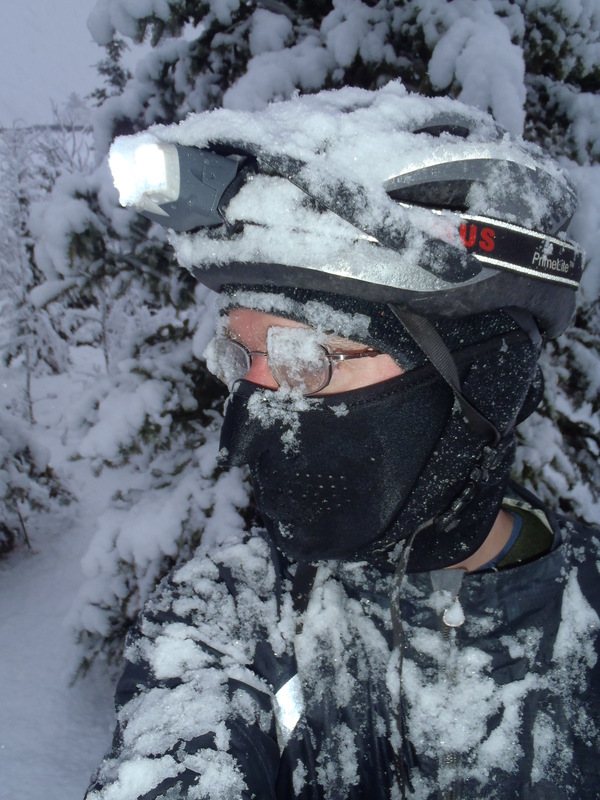 This was an almost perfect winter ride. 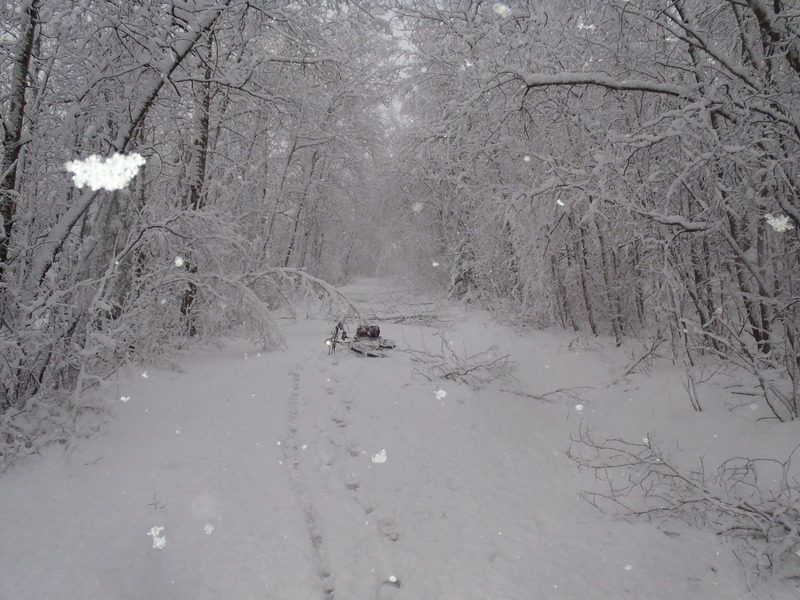 Enough snow had fallen to make it fun but not so much that the roads were impassable. The fresh snow wasn’t yet churned up and for the most part I was able to make fresh tracks . It was a little bit before 7AM and the traffic was still quite light. 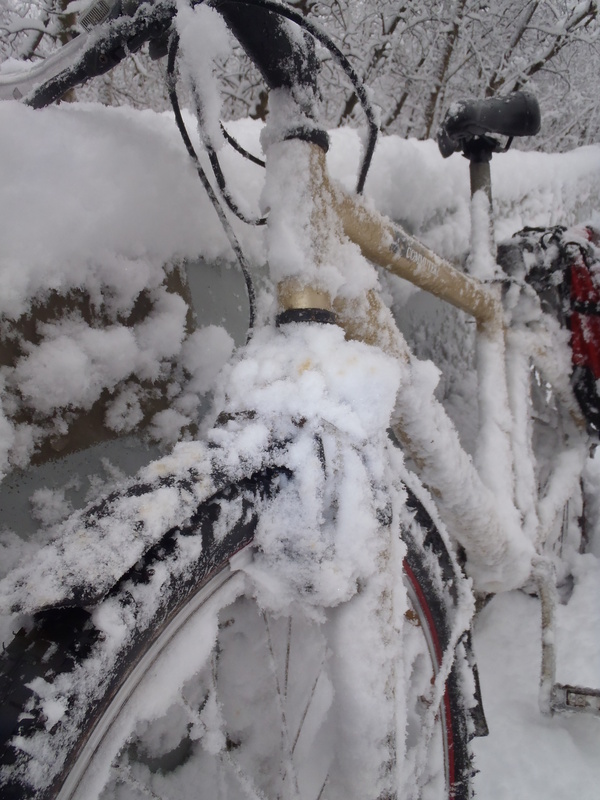 How can so much snow accumulate on a moving bike? There was no snow at all here on the previous day. 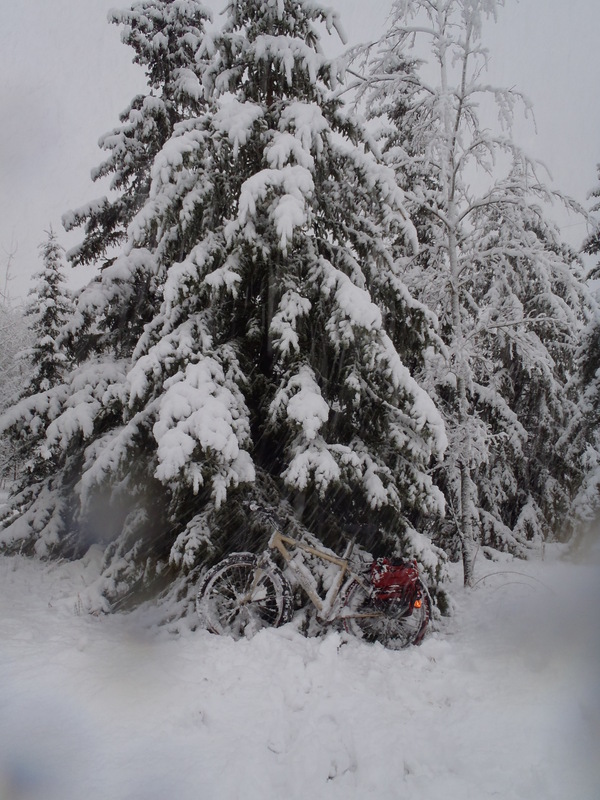 As I pedaled through the city there I spotted many branches snapped off trees by the weight of the snow. I gave this little thought until I reached Mill Creek Ravine and headed up the wooded trail. 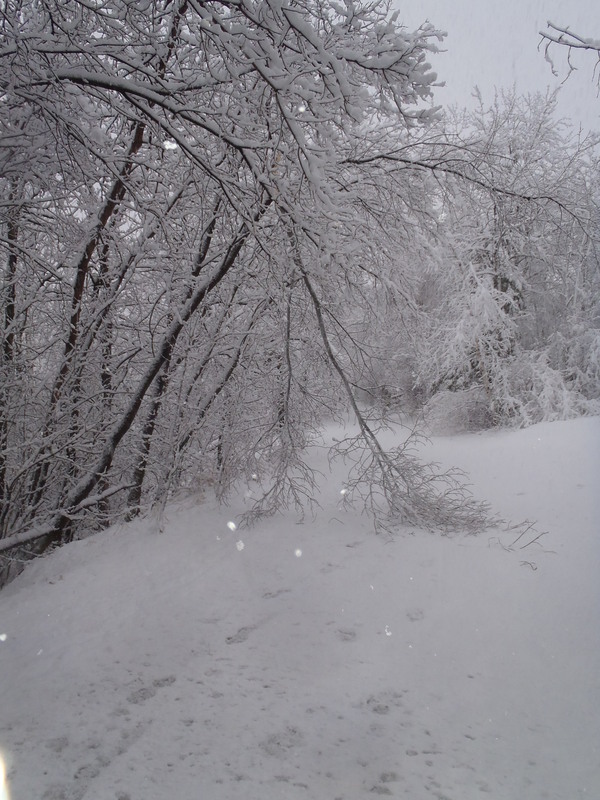 Here the branches were heavily weighed down and drooping over the path. Several larger limbs had broken off and fallen to the path making an interesting obstacle course. There were creaks and groans and snapping noises from the woods on each side of the path. The wiser voice of my younger, forest-hiking, rural self was advising me to get the hell out of there. I was nervous, but not so much so that I didn’t stop to take several photos. The stupidity of my persistence was brought home when I reached a point where a fallen tree was blocking the path. 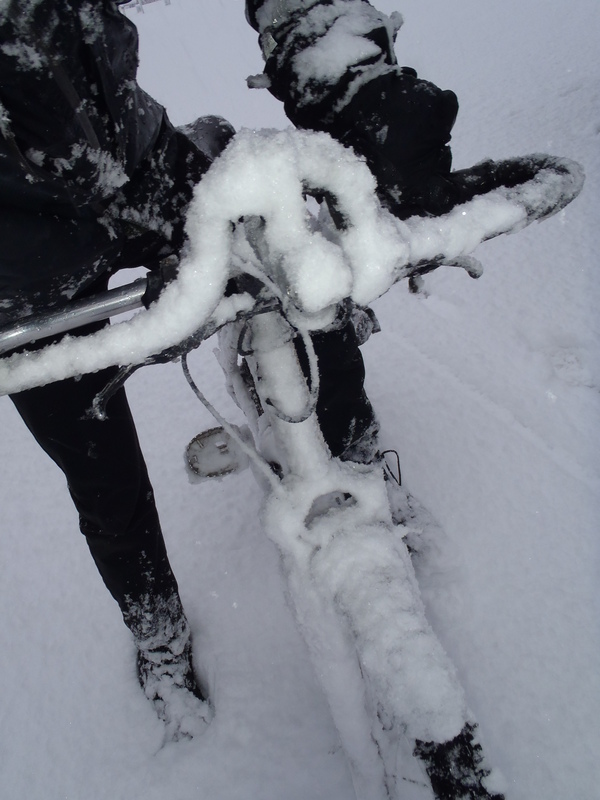 I had been following the track of a single cyclist who had traveled up the path before me. 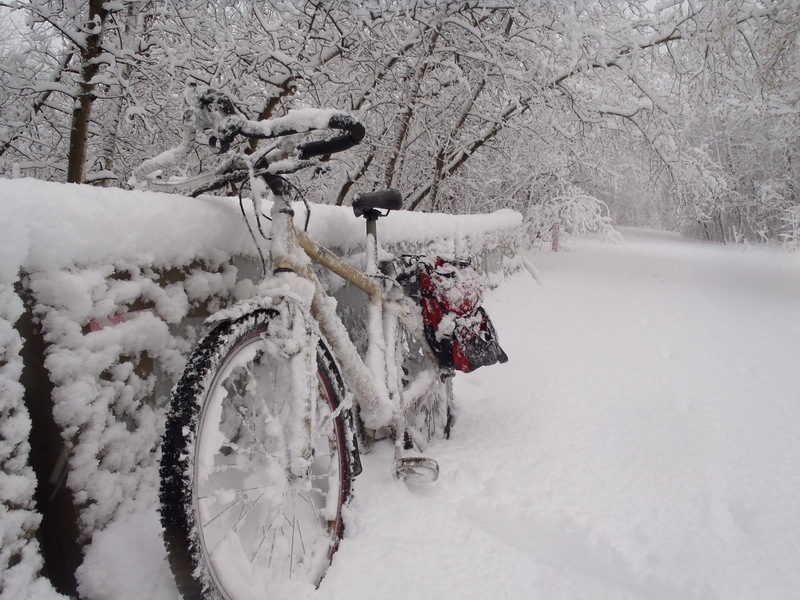 Considering how fast the falling snow was covering tracks I would guess that the other cyclist had been on the trail no more than a half hour before me. 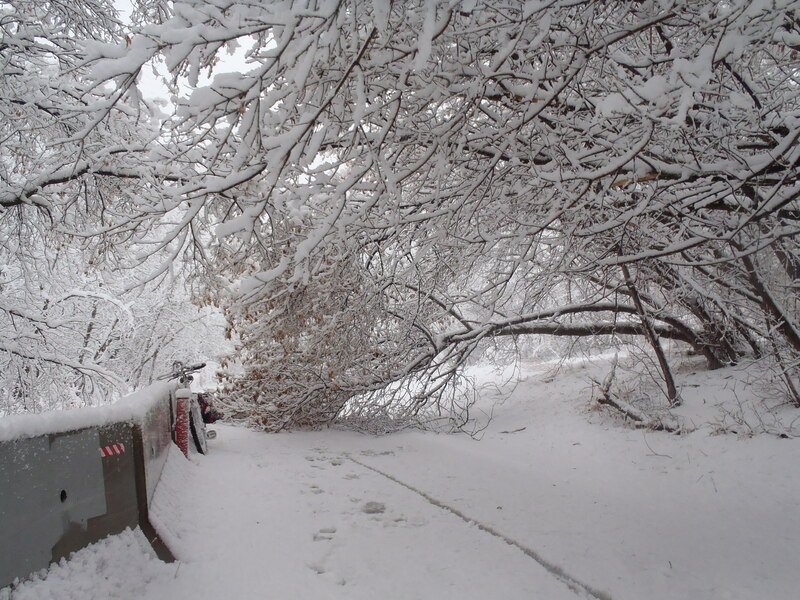 Their trail went directly under the fallen tree. It had fallen a only a short time after they had passed. I couldn’t ignore this warning and I sensibly fled the ravine at the very next exit. As I was leaving I stopped to chat with a woman walking her dog who was leaving the ravine for the same reason. I really had no choice but to obey this sign. Heading back up onto the city streets I was back in a realm of more predictable hazards. The rest of my ride to work was uneventful. Traffic density was starting to increase and twice I pulled over to the side of the road to let groups of vehicles pass me. I saw one other cyclist during my entire ride. I waved at him and he shook a fist in the air and yelled “Warriors!” which was silly enough to make me laugh out loud. By the time I finally reached my workplace I was convinced that I’d be taking a bus home . As it it turned out, I was wrong. By the end of the day it was warm and sunny, the snow had almost completely melted from the roads and it was almost as if the storm had never occurred. 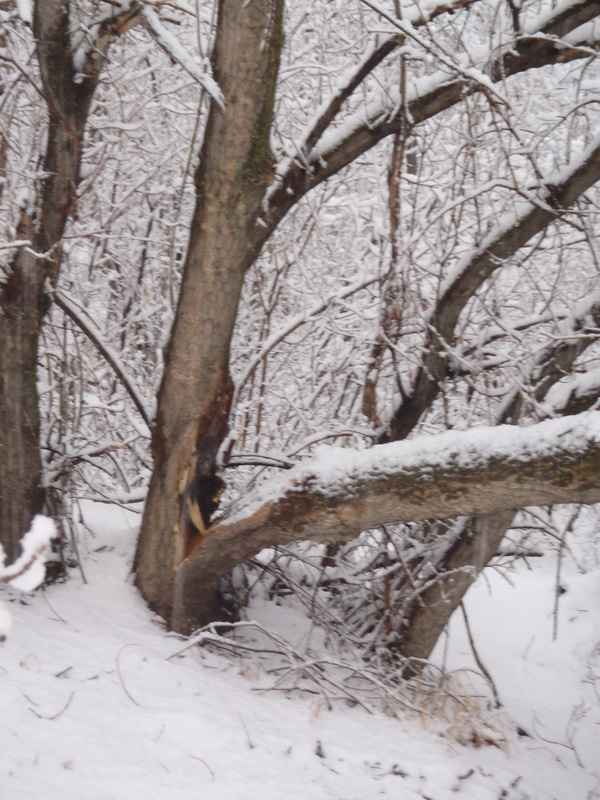 The city crews had been hard at work clearing fallen branches and all power outages had been resolved. This was an ideal end to the last snowstorm of the season.